In anticipation of accepting a new child into our classroom, I had my prekindergarten children create a welcome card. They spent quite some time writing their names, thinking about the colors they thought this child may like and drawing pictures for her. The next day, our new friend bounded into the classroom ready to learn. Her mother told me the impact the card had on her child. They had read it several times that first night along with all the children’s names. This one act of kindness made an impact in this little girl’s prekindergarten experience at Stepping Stone School. Throughout the month of February, our teachers will prepare several activities centered around the Communities of Character™goal of Kindness. Children will not only make cards for others, but also read stories, identify acts of kindness, and participate in many other age-appropriate activities to help them understand more about kindness. Giving Creatively: Creative giving may include baking cookies for community helpers like firefighters and police officers, donating unused toys, books, or clothing. Children may choose to make cards for local children’s hospitals and nursing homes. Creative giving is a physical way for children to practice kindness. Encouraging Manners: Even infants and young toddlers can practice manners by using the American Sign Language (ASL) signs for “please” and “thank you” as parents introduce manners. 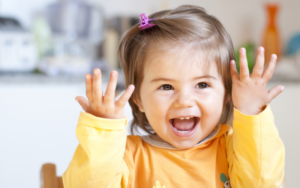 Teaching children to use the ASL signs early encourages stronger language skills later in life. When first teaching a sign, gently guide your child’s hand to make the sign. With practice, she will learn to use the signs independently. Introducing Empathy: Describing how a child is feeling helps him learn how to identify his own feelings. Helping a child identify how another is feeling by pointing out physical clues helps him to recognize feelings in others, a concept central to empathy. Through empathy, children learn to recognize when their kindness is needed. As we focus on kindness throughout this month, children will learn and grow in their understanding of how their attitudes and actions can improve the attitudes of others. They will spread kindness and make an impact on those around them.